What size dog house does your dog need? Unlike people, dogs require smaller doors than what their total height is. For instance, a coyote's total height is between a spaniel and a Labrador Retriever (24 to 28 inches tall), yet his door opening is 8" to 10" in diameter. This is why Blythe Wood Works has developed the A-B-C Method for determining the ideal dog house size for your pet. Find the right size for your dog! Remember, the first consideration for a proper sized doghouse is the door. He has to get in and out before any other considerations are made. If the dog's “A” measurement is 8 1/2”, the door height needs to be at least 11 1/2”. 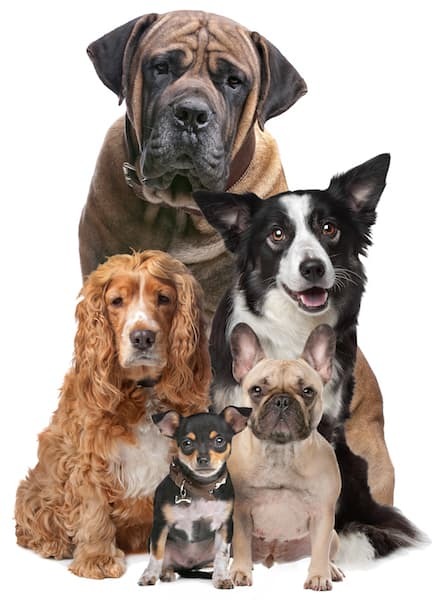 If your dog is not fully grown, you may want to consult our Dog House Sizes by Breed page to determine its approximate full grown size and what size dog house is best for that breed. The A-B-C Method is a copyrighted formula, developed by Blythe Wood Works from years of experience, for determining the ideal dog house size for your pet. A. The distance from the dog’s shoulder to the bottom of his chest. B. The distance from the dog’s nose to his flank, not including the tail. C. Distance from the top of the dog’s head to his toes. A. The door opening height needs to be at least 3 inches taller than the shoulder to chest measurement. Example: If the "A" measurement is 10 inches, the door height opening needs to be 13 inches. B. The width and depth of the house should be at least the "B" measurement (the distance from the dog's nose to its flank, excluding tail). Example: If the "B" measurement is 30 inches, then the minimal size house should be at least 30" wide by 30" deep. C. The "C" measurement is utilized to determine the correct dog house height at the peak. The minimal house height should be 1.25 x the "C" measurement (the distance from the top of the dog's head to his toes). Example: If the "C" measurement is 23 inches, then 1.25 x 23 = 28 3/4 inches. The shortest dog house this dog could use would measure 28 3/4 inches from the peak to the ground. Therefore, a dog of size A: 10" B: 30" C: 23" would require at least a Blythe Wood Works Large size dog house with a standard vinyl flap door or an upgrade Seal Safe door. Please note, the ABC formula calculates minimal sizing requirements. Larger than necessary houses are okay, but in extreme colder elements without our electric Dog House Heater unit, the extra space makes it more difficult for your dog to stay warm. The recommendation made by this formula is purely for informational purposes. While Blythe Wood Works makes a best effort for these recommendations to be accurate, Blythe Wood Works assumes no responsibility for size recommendations that are deemed inaccurate by anyone who uses this formula. Warning: This formula is copyrighted. Any commercial use and any reproduction of this formula without written authorization from Blythe Wood Works is illegal.